Road Trip 2017: The Great Midwest, Part 6 — Chicago to Liberty, Ind. 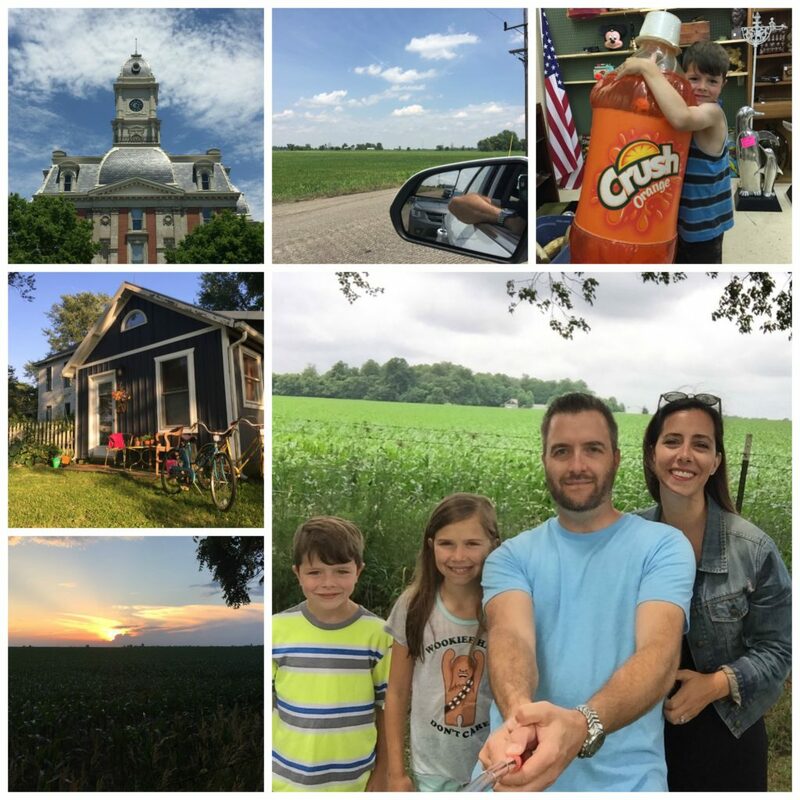 DAY 11 – Chicago to Lafayette, Ind. The weather had turned gloomy again in Chicago, so it was a good time to hit the road. I, for one, was more than ready to leave our hotel, with its way-too-thin walls (I think we were staying next to Dr. Dre) and our room’s ant infestation. I promised the kiddos Dunkin’ Donuts, and we finally found one along the Lincoln Highway well south of the city. We were looking forward to finally enjoying a Long John — with cream in it — the way they’re supposed to be. But, unbelievably, even DD’s Long Johns were sans cream! It was like some mass conspiracy! The girl at the counter was gracious enough to let us exchange them for regular cream donuts, but when we bit into them in the car, it turns out they were filled not with sweet white cream but with yellow custard, aka Boston Creme! Ugh. Guess we’d just have to wait until we we’re back in good ol’ Western PA to make things right. At one point along the highway we spotted huge windmills in the distance stretching as far as the eye could see, and believe me, that’s a long way in table-flat Indiana. It was amazing. Then we spotted an old-fashioned movie theater along a main street to our left. 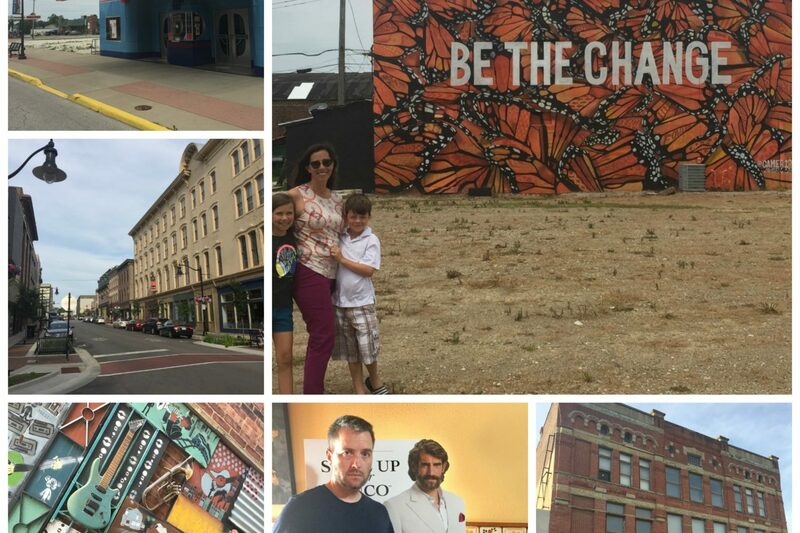 So jumping on the breaks, I pulled off the road and into tiny downtown Fowler, where we discovered an incredible butterfly mural on an old brick building with the words “Be the Change.” Very cool. When we approached the old theater, we found that it was open, so we stepped inside to snoop around a little. I gotta tell you, it was kind of spooky. There didn’t seem to be anyone there, even though the lights were dimly lit and the theater was obviously open. After a quick Google search, we found that the Fowler Theatre is an old movie house that had been saved and restored thanks to some very wise and generous preservationists. If only more small towns were as forward-thinking when it came to their historic landmarks. Good for them! Since swimming was out, we decided instead to head into the old historic downtown of Lafayette to grab some dinner and have a look around. We ate at a very nice authentic Mexican restaurant (there was around a dozen or so in town) and, for some reason, had the place basically to ourselves even though the food was delicious and the margaritas tasty. Afterwards we parked on the main drag and walked around taking photos of the beautiful town. Lafayette features a wonderful, clean streetscape with fresh flowers and several very cool murals adorning the alley walls. The kids were ecstatic when we stumbled upon Main Street Amusements, a little shop filled with pinball machines and vintage arcade games, including “the World’s Largest Pac-Man” game. On the way back to the car, I popped in at the Lafayette Brewing Co. and grabbed myself a growler of their Fruity Juicy IPA to go. Then we headed back to the hotel to relax and call it a day. DAY 12 – Lafayette to Liberty, Ind. I wasn’t sure what today would hold. After all, we would be driving through central Indiana with no real plans until we reached our Airbnb—a farm cabin in Liberty. At first I considered just taking the highway and getting to the farm as soon as possible. But at the last second I routed us on a path down Rt. 38, which would take us through four or five small towns along the way. And, boy, am I glad I did. Our first stop was Frankfort, home of the stunning, Second-Empire-style, Clinton County courthouse. (We didn’t know it at the time, but beautiful old courthouses would be the theme for the day.) Frankfort is such a cool small town with a main street that went in a square around the courthouse. We got out to look around and take a few photos before heading on down the road. Next up was Noblesville, and again it was dominated by an amazing French-Renaissance-style courthouse, built in 1879. There was also — much to my dorky delight — a street with train tracks going right down the middle of it. Then I noticed some flyers in store windows that said “Save the Train.” Stopping in the local Visitor Center, I spoke to a friendly gentleman named John Schleeter and asked about the train. Turns out that Noblesville has a neat old excursion train that runs along the 34-mile Nickel Plate Road all the way down to Indianapolis. Apparently the train was in danger of being discontinued and the rails torn out due to financial problems. A petition has been started to save this historic train and railroad (I signed it!). Hopefully they’ll be able to find a way to keep it. In downtown Noblesville I also discovered one of the best selections of used records I’ve ever seen, in the basement of the Noblesville Antiques Mall. I could have spent the entire day there browsing, but that wouldn’t have been fair to the rest of the crew. So I searched for a half hour or so and found three great LPs: The Police’s “Synchronicity,” the Alan Parsons Project’s “Eye in the Sky,” and Peter Gabriel’s self-titled 1980 release. Back on the road, we passed through a couple smaller but just as charming towns before stopping in Cambridge City, a beautiful old canal town, for dinner at the No. 9 Grill. Next, we hit the backroads to our next night’s stay, the Hannah’s Creek Farm guest cottage in Liberty. Much like our lovely stay at the Circle M Market Farm in Blanchardville, Wis., Hannah’s Creek Farm is another peaceful, bucolic locale right smack in the heart of Indiana corn country. After letting the kiddos splash around in the creek looking for minnows and crawfish, we settled into the cottage and then headed out back for a campfire with the friendly owners, Sharon and Will. We passed a wonderful evening sitting by the fire and cooking s’mores as we watched the sun fall below the distant horizon. It wasn’t until the skeeters chased us inside around 10 p.m. that we decided to call it a night. The next day we’d be leaving Indiana and heading for our final stop in Columbus before heading home. 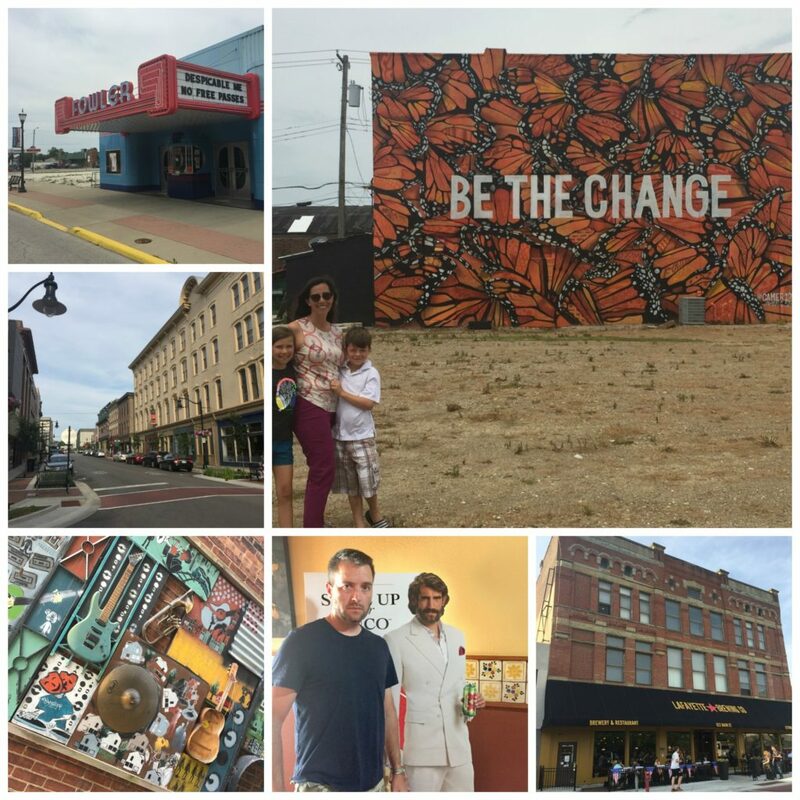 Road Trip 2017: The Great Midwest, Part 7 — Columbus, Ohio to Beaver, Pa.